Over the last 250 years, no matter where Aboriginal and Torres Strait Islander people have come from, the prospect of being dragged to somewhere else was always present. No matter what freedoms have been eked out through hard work and decent values, people could still be removed at the stroke of a pen, with the alternative being incarceration. Each and every aspect of our lives could fall under the control of the almighty welfare board and their local representatives. We have lived lives of having things done to us. This was often couched in terms such as “for them”, “for their protection” and so on. But from a fundamental human sense, it felt like having things done “to” us. From our vantage point today, we feel a great sadness and much regret, that we still to a large extent do not have full control of our own destinies. It will only be through an empowerment and development agenda, and having greater control over our own lives, that conditions will improve for Aboriginal communities culturally, socially, spiritually and economically. Sean Gordon applies his considerable leadership skills to drive Aboriginal economic development and reduce government dependency through creating real opportunities and benefits for communities. A Wangkumarra/Barkindji man, Gordon is a strong advocate of self-determination for Aboriginal communities, and for social, cultural and economic empowerment. 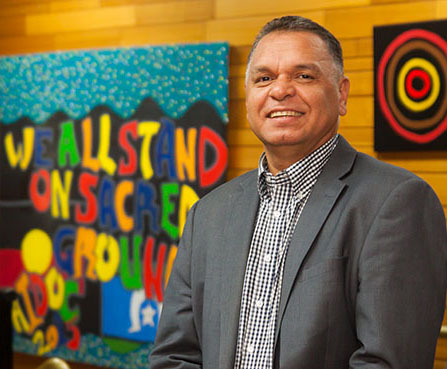 For the past eight years, he has served as Chief Executive Officer of the Darkinjung Local Aboriginal Land Council, a leading Land Council focused on improving the health and wellbeing of the NSW Central Coast community. Under Gordon’s leadership Darkinjung has built combined assets in excess of $55 million, and is currently developing innovative affordable housing and home ownership models that allow potential homeowners to build equity and save a cash deposit while renting community housing. As an educator, Gordon has developed and implemented vocational education programs with the TAFE NSW Hunter Institute, and advised the NSW Government on the development of culturally responsible strategies for Aboriginal adult education. Gordon is deeply connected to community, and has served on numerous boards and advisory groups. He was inaugural Chair of the Barang Regional Alliance, and serves as Chair of the Empowered Communities: Empowered People Leadership Group, facilitating sustainable reform through strategic partnerships between Indigenous leaders, governments and industry.